You can follow the rest of the afternoon's Premier League action here. Tottenham manager Mauricio Pochettino, who turns 47 today, speaking to BBC Match of the Day: "Yes [Hugo] Lloris’ save was a massive present. I am so happy because we didn’t deserve to lose the game - we were better than them so it would be a shame to lose the game in that way. I am happy with the performance, it was a tough game and difficult to play Arsenal but I am happy after two defeats to take a positive result to build confidence to go to Tuesday and Borussia Dortmund and go through to the next stage of the Champions League." On the first goal: "The problem was with communication not Davinson (Sanchez) mistake. We talked at half-time. After 15 minutes we were playing like we are 1-0 down in the 90th minute and we take too much risk one v one. The character that we showed was great to come back and the way we played maybe wasn’t great but we showed great character and sustained effort during the 90 minutes. Tottenham were better than Arsenal in the different aspects." On refereeing decisions: "If you ask me about offside you need to ask about the moment after 12 minutes, Xhaka on Kane, which wasn’t a foul. That situation is so difficult to understand. The most important thing is the performance was good to build a positive run. "In football there are different circumstances, sometimes you deserve and you don’t get and sometimes you get when you don’t deserve. The most important was mentality. It is a good result to keep gap and look forward to arrive in good condition against Dortmund." Arsenal manager Unai Emery on BT Sport: "We are fine in our way, today being competitive and adapting our performance. It demanded a lot of transition for us and it is good, not the result because we can win, but we can be stronger in our mentality after this match going forward. "One month ago I said to everybody VAR is coming forward - it is difficult for referees. You can analyse with TV and it is easy but referees can't use that now. Maybe today's match is different with that but I understand it is difficult. The referee is a big personality - it is not easy to balance the two teams but I like this referee. "We need to be together to be strong like a team. We need a keeper like Leno today and Ramsey’s last derby, maybe he can play more in the future, but for now I am happy for him. "We are thinking each match for three points, to continue in our way, our target is clear. We can be proud of everybody in our work. We showed everybody we are creating and doing it our way." Emikomi: What a day for Aaron Ramsey, an excellent Gunner indeed, sad that he's leaving in the summer but he'll always be an all time Gunners favourite. Pete: Can someone remind me why Arsenal are letting Ramsey leave the club? Seems an amazing, crazy decision?!! Tottenham's Harry Kane speaking to BBC Match of the Day: “It was another good derby, a passionate one, it had a bit of everything. In the first half we were disappointed; we created a few chances but were not clinical enough. The second-half was just about fighting for the team and club and we did that and we got the goal we deserved. Towards the end of the game it went a bit crazy. "For us it was important to stop the losing streak, at this point it might give us a little boost with a big game in the Champions League and then Southampton." On their top-four chances: "Over the last week we have put ourselves under pressure but we have done it in the past and every game is a big game. "I feel good after three tough games coming back from injury it'll be good to get the freshness back. "Pochettino wants us to go out there with passion and thankfully we did that." The result ended Tottenham’s run of 28 Premier League games without a draw, the third longest run ever without a draw from the start of a top-flight season. Spurs goalkeeper Hugo Lloris to BT Sport: "The game was a bit crazy. At the end it could have been 2-1 for either team but it is a good point for us after a bad start in a tough week. On Aubameyang's penalty, which he saved: "Everything went so quickly, I always protect my defender but I also respect the decision referee." Sulaimon: We just witnessed a real derby with penalty scored, penalty missed, many yellow cards, a red card and a draw to settle the tie. Andrew: Absolutely cracking game - I hope that’s an indication of what’s to come this weekend and not the pinnacle. Tottenham striker Harry Kane speaking to BT Sport: "We came out in the second-half fighting and we put the pressure on with good tackles and aggression. We needed to go on and get the second and thankfully Hugo saved the penalty at the end and that point was the least we deserved." On his penalty: "It evens itself out throughout the season and the game had a few not go our way and that one did. 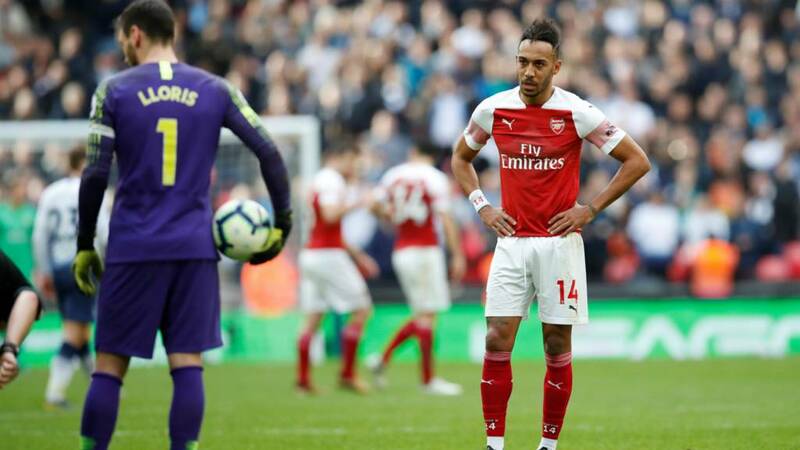 "Two disappointing results in a week, this was the perfect game, a north London derby to show passion and show fans we are ready to fight for the rest of the season. It’s a point, we wanted three but it stops the losing streak and we can focus on Dortmund and then Southampton. "In the first half we had the aggression but they caught us on the counter and final ball wasn’t quite right. We had to come out fighting and show what we were made of and thankfully we did." You can read Phil McNulty's match report from Wembley here. Rob: I see a theme developing. VAR is used (takes a while) a penalty is taken away, we complain how long it took. VAR is not available a penalty is given, we complain that we don't have VAR. Go figure. Pete: Aubameyang should be arrested for impersonating a striker. Victor: Lacazette in first half, Aubameyang in second half. What a waste of chances.. Here's how the league looks after that result. The battle for the top four could be interesting with Spurs dragged straight into it, while they fall even further behind in the title race. Manchester United face Southampton at 15:00 GMT, while Chelsea play Fulham on Sunday. Adam: I’m not a fan of either team and there’s no way in hell that's a red card. Hamza: May aswell ban tackling, never a red card. Let's recap on the last few minutes of the match. All over after a manic finish.